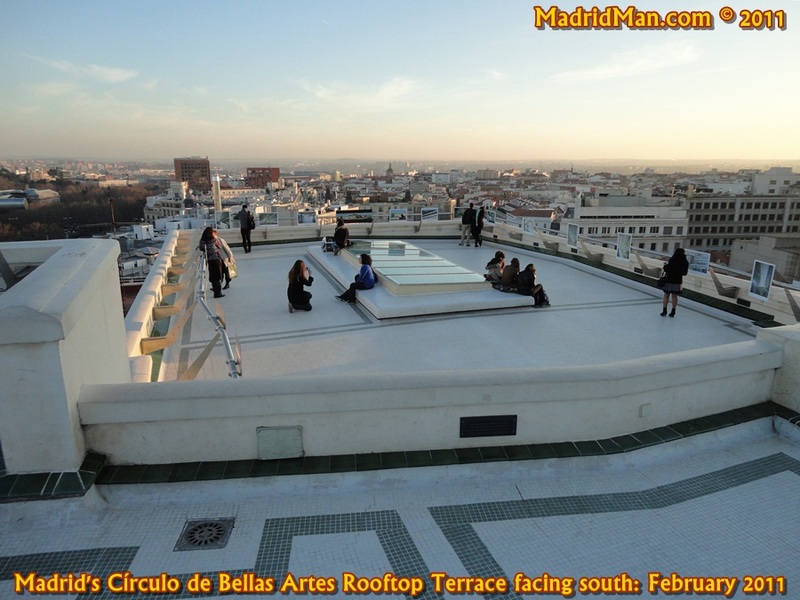 The other day I went to the rooftop terrace of the Circulo de Bellas Artes in Madrid. It was my first time and couldn’t believe I had yet to discover it. 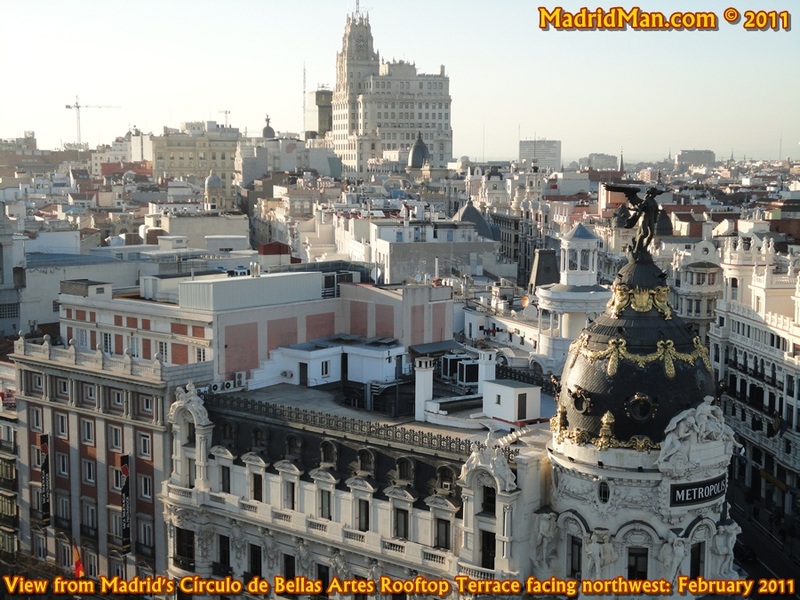 Sure, I’d been to the lower level Café & streetside terraza as well as attended many concerts in the different “salas”, but had seen Madrid’s skyline from this height before – albeit only about 10 floors up. The Circulo de Bellas Artes is a non-profit cultural center founded by a small group of artists in 1880. It hosts art exhibits, theater, concerts, and even has its own radio station which features cultural programs, world music, and interviews with poets. 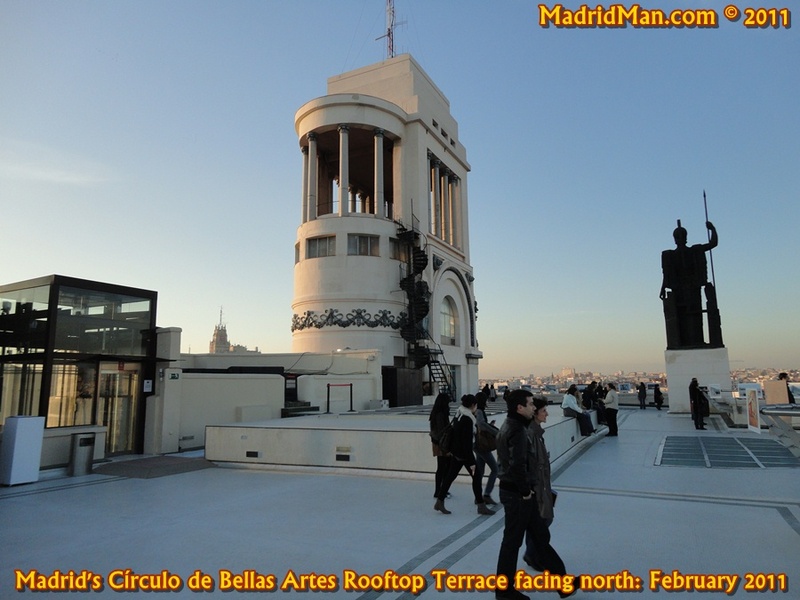 As far as I can assess, the rooftop space of the Circulo de Bellas Artes has only been open to the public for less than 2 years. (please comment if you have other info or experience) It’s also available for private gatherings with bar-service. If it weren’t for a Facebook friend who’d posted photos of her visit two days earlier I never would have known about it. It costs only 2€ to take the elevator up and tickets must first be bought at the counter next to the Calle de Alcalá-side Café (just beautiful!) or entering from the side street Calle del Marqués de Casa Riera, between the streetside Teatro de Bellas Artes and the Bellas Artes book store. These days the rootop terraza is only open until 7pm but imagine it to be open later in the summertime months. I was there at 6pm, just before the sunset, and it seemed many others had the same idea. The light was beautiful on this typically clear-sky day in Madrid, giving a brilliant glow to the face of the Palacio de Comunicaciones (Madrid’s “new” City Hall) and Casa de América on the Plaza de Cibeles to name only a few. I was surprised to see the adjacent Banco de España had their own rooftop heliport! The “Metropolis” building’s tower-top angel was directly in front of us. And the Puerta de Alcalá and even more distant Torre España – “El Piruí” – were clear on an otherwise smoggy day. The tall Telefónica building’s clock tower on Gran Vía glowed in the sun’s reflection and near-rush-hour traffic formed far below us. To say I recommend a visit to the Círculo de Bellas Artes – whether it be to the rooftop, café, streetside terraza, or attend a cultural program of some sort – would be an understatement. 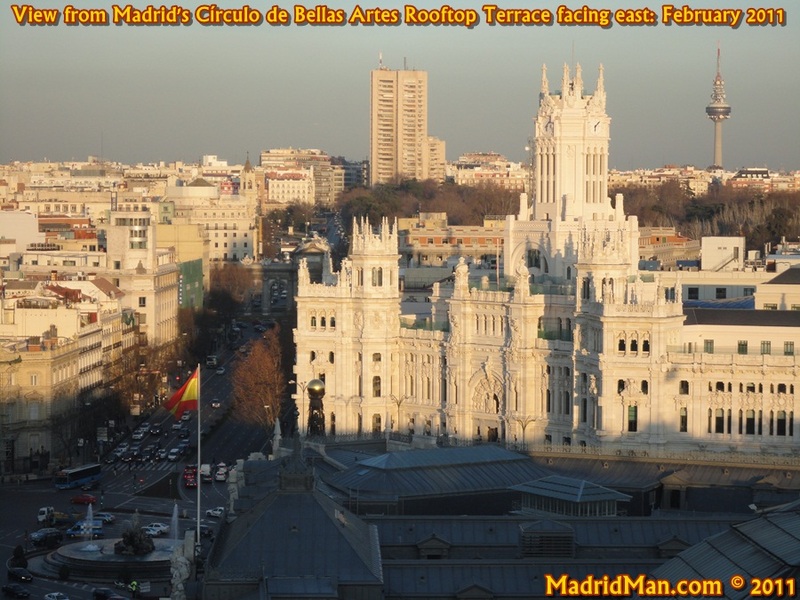 Below Video (not mine): YouTube video of “Views from the rooftop of the Circulo de Bellas Artes in Madrid”. Posted March 2010. This entry was posted in Entertainment, Photos and tagged Art, art exhibits, azotea, Azoteas de Madrid, Banco de España, cafe, Circulo de Bellas Artes, concerts, cultural center, culture, Gran Via, Madrid, Metropolis, Palacio de Comunicaciones, Photography, Piruli, Plaza de Cibeles, Puerta de Alcala, rooftop, skyline, skyline view, Telefonica, terrace, terraza, theater, theatre, Video, view. Bookmark the permalink. great pictures, and lots of memories. Thanks. The views are indeed sublime,glad you enjoy them too. And yes the Banco de España heliport is there on the top too; but the CBA gives better views in my opinion. It was an afternoon to remember, that’s for sure. I’d never seen downtown Madrid from this perspective. I mainly wrote the blog because the CBA’s rooftop terrace seems to be one of those lesser-known jewels of Madrid. NO ONE talks about it! And at 2€ for the visit, you can’t beat that! 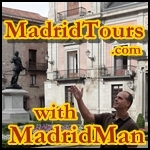 Even though I have lived in Spain for 7 years, my first and only visit to Madrid was some 10 years ago – and I hated it! – On refelection, we did pack expecting sunny weather in the middle of December only to find the frosts so harsh that we could not leave the Hotel. One of our Spanish friends has invited us up the the city for the weekend, and I can honestly say I am now looking forward to it given we will have a native as guide. I will be sure to check out the rooftops ! Yeah. 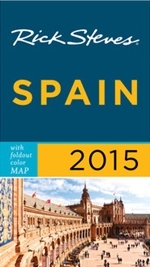 It’s a common misconception that all of Spain is always sunny and warm all year around. I think this is the perception mainly outside of Europe, anyway. DO check out those rooftops! You’ll love the view. Enjoy your re-visit to Madrid! Absolutely gorgeous! Great shots. You are lucky to get these beautiful shots! I am delighted to have found your blog. I will be in Madrid from October 24 until 29. I am absolutely putting CBA on my itinerary. I am a hair stylist and am traveling there from the USA to lift the spirits of some women who have been through some hard times. A team of us will be doing make overs and I am responsible for the hair styles. We are very excited for this opportunity. In my research, I am having difficulty finding a beauty supply source. I can not transport on the plane the chemicals and products that I will need for my work. I know there are lots of fine hair stylists in Madrid and they buy their supplies locally but I cannot find a resource for the hair colors I will need. I would be grateful for any leads or suggestions you may have.